A dead car battery can throw a wrench into your plans. Luckily for you, you have found this article on how to charge a car battery that will help ensure that you won’t have to deal with a dead car battery ever again. Also, this guide will help give you tips on what to do if you get stuck with a dead car battery. We will cover how to jumpstart a car so you can get to where you need to be if you don’t have time to charge your battery. Read on to learn everything you need to know about do it yourself car battery charging. 1 I. How to charge a car battery at home? 4.1 1. How to charge a battery without a charger? 4.2 2. How long do car batteries last? 4.3 3. How long does a car battery last without driving? I. How to charge a car battery at home? If you encounter a dead car battery, there are a few methods you can use to charge it. We are going to answer all the possible questions you might have about these different options. The two main options for charging a car battery at home are with jumper cables or with a battery charger. We will go into detail about each one below. The first method for charging a car battery that we are going to look at is with jumper cables. The reason we are going to cover this method first is it is the fastest option to get your car running and going again. If you run into a dead battery, then chances are you were trying to go somewhere and need the problem solved as quickly as possible. Thankfully jumper cables make the problem easy to solve. All you need to charge your car battery with the jumper cable method are jumper cables and another vehicle. Don’t worry, if you don’t have another vehicle or thing with battery handy, then we will cover another option below for jumping your car. Get the set of jumper cables. Get another vehicle close enough to your car that the cables will reach from their battery over to yours while connected. Batteries can be in all kinds of positions in a car, so being in an open space like a parking lot or driveway makes this more accessible than in a garage, but sometimes you just got to make do with the situation and having long jumper cables can make things easier. Pop the hood of both vehicles and use the hood prop to keep the hood open. Clean any corrosion off the battery terminals on either vehicle. The battery terminal is the raised metal piece that has a wire coming from it. And the red clamp from the same side of the jumper cables to the positive terminal on the dead battery. And then the red clamp from the same end to the positive terminal on the working car. When connecting the jumper cables make sure that both cars are off and make sure that they are connected all the way and tightly or else this won’t work. Start the working car and let it run for around a minute. Try to start the dead car. If the dead car still does not start, then rev the engine of the running car. Try again to start the dead car. If the dead car still won’t start, then the battery is too dead to be jumped or the vehicle you are using to try to jump it doesn’t have a strong enough battery. At this point it is time to disconnect the cables. Remove the black clamp and red clamp from the working car and then go to the dead car and remove both clamps. You can now turn off or move the working car where you want it. If the previously dead car is running it is now a good idea to drive it for at least 20 minutes to recharge the battery. If the dead car is not running you will have to try another method to get the battery working. How to charge a car battery without another car? What if you don’t have another car available though? Well, you have a couple of options. The first is unconventional, but a mower battery is the same volts as a car battery and usually similar, so you could try using a mower to jump your car. This will work if you have a good mower battery with strong cold cranking amps, but won’t if it is a cheaper battery. To do this you follow the same steps as above only this time you will be connecting the other end of the jumper cables to a mower battery instead of a car. The other more reliable option to jump-start your car without another vehicle is to get a portable jumping kit. It is a box with a battery and cables built in. As long as you keep the battery in the box charged it can be used to jumpstart your car. We will explain the steps needed to use one of these jumpstart boxes. Get the portable jumping kit and bring it over to your car. Pop the hood of your car and prop it open. Locate and clean the battery terminals on your battery to make sure there is no corrosion on them. Open the portable battery kit and get the wires out. Connect the jumper cables to the portable battery if needed. Clamp the black clamp to the negative terminal on the dead battery. Clamp the red clamp to the positive terminal on the dead battery. Turn on the portable battery box. Follow the instructions if the box gives you any and then wait around a minute to let energy flow into the battery. Try to start the car. It should start right up, but if it doesn’t wait a little longer and then try again. If it won’t start it is too dead. No matter if the car is running or not turn off the portable battery. Disconnect the red positive cable from the battery and then disconnect the black negative cable. Leave car running and put portable battery away. Take vehicle on a 20 or so minute drive to help recharge the battery. Now we are going to talk about the longer method for charging a car battery, but it is the more reliable method. Sometimes a battery is too dead to jump, and that is when you will have to try charging it with a charger. Other times you won’t be using the battery for a while, and that is another good reason to charge a car battery with a charger. As you will see charging a battery with a charger is just as simple as jumping a car battery, so you shouldn’t be afraid to charge your car batteries at home. Before going into detail about how to charge a car battery with a charger though a lot of you may be wondering can you even charge a dead battery. The answer is yes you can, but it will take some time, especially if the battery is really dead. Depending on the cold cranking amps of the battery and the amps at which you are charging the battery will determine how long it takes. At six amps a battery can take eight hours for the smallest ones to charge and up to sixteen hours for stronger batteries. At higher amps, you can cut this time in half. For example at ten amps the time it takes is half, and at thirty amps it only takes between two to four hours to charge a battery. Since it takes so long you may be wondering can you charge a battery overnight and the answer is yes, you can charge a car battery overnight. It is actually one of the best times to do it since it takes a battery so long to charge and it helps make sure the battery is on the charger long enough. This means you can hook the battery up in the evening and then leave it connected all night. In the morning your battery should be fully charged and ready to go. Plus doing it overnight you can do it at a lower amp which will help your battery last longer, and most chargers will shut off when the battery is full, so you don’t have to worry about damage to your battery. So now that some of these questions are out of the way we will go into the steps of how to charge a car battery with a charger. Put the charger in a place where cables aren’t going to be in the way and there is open space around the charger. Plug the charger into a power supply. If you are going to be charging a battery for an extended period, then it might be best to remove the car battery from the vehicle, so you don’t have to leave the hood open and have wires running across the floor. Also, if your cables won’t reach the battery you will have to remove it. If removing battery go to step 4 and continue in order. If not removing battery, then jump to step 6. Remove the car battery from the vehicle by disconnecting the negative and positive terminal and then lift out. Place the battery near charger on a stable surface. Connect the black clamp to the negative terminal on the battery. Connect the red clamp to the positive terminal on the battery. Set the charger to the proper amps that you want to charge at. Leave the battery for the time needed to charge it fully or overnight. Make sure your charger has auto shut off or switches to a trickle charge before leaving it though so you don’t overcharge and damage the battery. When you come back check the battery charge indicator and make sure battery is completely charged. If it is completely charged, then turn off charger. If it is not completely charged, then leave battery connected longer. After battery is charged and you turn off the charger disconnect the red positive clamp and then the black negative clamp. Reinstall battery if you removed it. Start vehicle to make sure that the charge worked. You can turn off vehicle and then put the charger up. 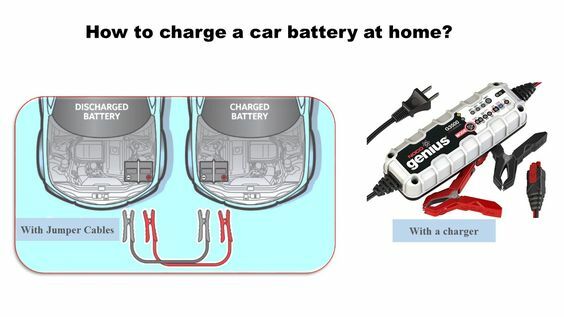 Now that you know how to charge a car battery with a couple of different methods . So we can look at a few reasons why a charge might not work. First, the most common reason why charging a battery might not work is that you might not have had the charging cables connected all the way. Make sure to connect the cables completely before walking away or else you might come back to a battery that still hasn’t charged. Along with this make sure the charger is plugged in all the way and on. The next reason why a charge might fail is that the terminals on the battery may be dirty. Clean off any corrosion from the terminals before charging. Lastly, the battery might be too old to charge. If the battery is old, test it to see if it can even hold a charge. If it can’t, then there is no point in trying to charge it and instead, you will need to replace it. If your car doesn’t jump start, then a couple of things could be going on. One, the battery you’re trying to use to jump the vehicle isn’t strong enough. Or, two, the battery is too dead to jump. If you have another vehicle with a better battery available, then you can try to get it to work. But chances are you will have to charge your battery with a charger if it doesn’t jump start. The best way to do that removes the battery and hook it up to a charger or get a ride with someone. With the help from someone, the battery can be taken to an auto place to charge and test. If they test the battery and it is bad, then you will have to get a new one and take it and put it in. If it is chargeable through the auto place can charge it, but it will take some time. Once they have fast charged it for you, you can take it back and hook it back up in your vehicle and it should start. You can then drive your vehicle around for at least twenty minutes to help charge the battery some more. If your vehicle still doesn’t start after having the battery charged, then your vehicle might be having other issues. The issues may come from bad spark plugs, sensors, or something else. So you will need a mechanic to look at it. 1. How to charge a battery without a charger? So you may be wondering how to charge a battery without a charge or more specifically how to charge a 12-volt battery without a charger? You can use jumper cables and another vehicle if you don’t have a charger. This will get the car running so it can charge the battery itself. Another way is, you can take the battery to an auto shop. They can charge the battery for you with their charger. But if you take the battery somewhere though it will take time to get it charged. So you might need another ride to get to and from there. 2. How long do car batteries last? A typical car battery will last about four years under normal conditions. As a battery age, the chemical inside breaks down and won’t hold a charge as good. This will cause the battery to need charging more frequently. If it’s four years or older and you start to have issues with the battery holding a charge, then you will want to replace it. 3. How long does a car battery last without driving? Without driving a car battery can last anywhere from as short as a few months to as long as a year. It just depends on the age of the battery and vehicle. 1) Make sure you turn off all the lights in your vehicle and that all the doors get closed, so no lights are left on. 2) Try not to idle for long periods, especially with the radio and lights on. 3) Don’t sit in your car with it off and the radio is going for long periods because like lights left on this can drain the battery. 4) If you know you aren’t going to be driving for a while hook the battery up to a trickle charger. Now you know all the different methods to charge your car battery. This complete battery charging guide gives you all the steps you need to charge. It also answers any question you might have when it comes to charging your car battery yourself at home. Charging your car battery is simple and keeping your battery working for years isn’t hard with proper care.